At 13 years old, Abimael is confined to a wheelchair unable to run and play like other kids his age. One of Abimael’s favorite things to do is to watch Disney movies and he loves anything Disney. 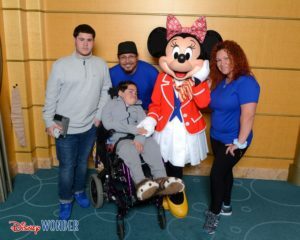 Abimael’s wish was to go on a Disney Crusie with his family. Over spring break he and his family set sail for the Bahamas! He couldn’t wait to spend time with Mickey and all the characters aboard the ship. The entire family had a fantastic time.